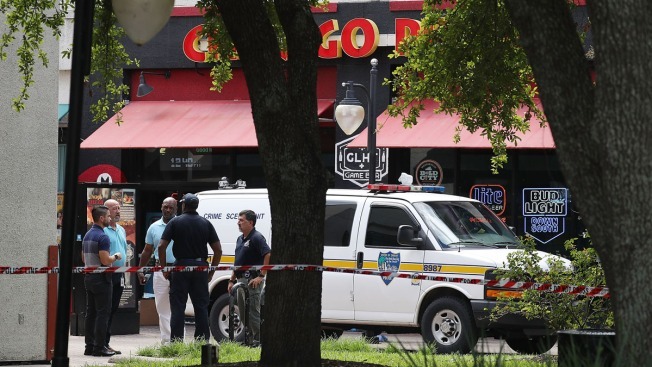 In this Aug. 27, 2018, file photo, law enforcement officials investigate a shooting in the GLHF Game Bar where gunman opened fire during a Madden 19 video game tournament in Jacksonville, Florida. A Texas man who survived a mass shooting during a video game tournament last month in Florida has died in a car crash. The Texas Department of Public Safety says 25-year-old Ryen Aleman of Robstown was killed Sunday in a single-vehicle wreck near Corpus Christi. 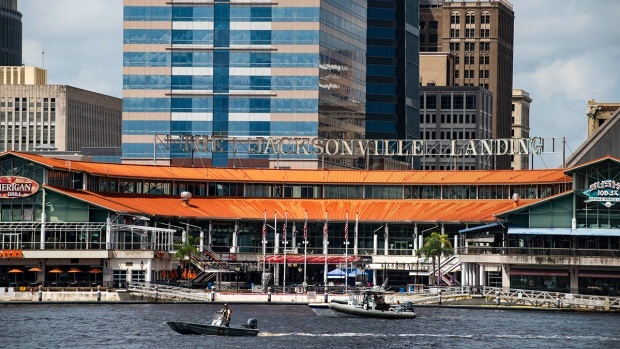 Aleman was among the participants at a Madden NFL 19 tournament in Jacksonville, Florida, last month when a fellow gamer opened fire, killing two people. At the time, Aleman told the Corpus Christi Caller Times newspaper that he crawled into a bathroom to escape the gunfire. Sgt. Nathan Brandley is a spokesman for the Texas Department of Public Safety. He told the newspaper Aleman lost control of his vehicle Sunday. The vehicle overturned and crashed into nearby railroad tracks. Brandley said Aleman wasn't wearing a seatbelt.